Trees represent life, peace, growth and nature. A tree is our most important contact with nature. They have been known to provide humans with the necessities for survival, including water, shade and oxygen. As much as trees have a special way of beautifying the environment, they can be equally dangerous when diseased or damaged. Great Neck, NY, January 11, 2019 --(PR.com)-- AAA Tree Service, a Long Island tree removal service, says its important to look out for the health of your trees, particularly if they are growing weak or seem diseased. If a tree is perceived to be weak it should be removed immediately. In some cases, diseased trees must be totally uprooted in order to control the spread of disease before it taints other plant life that surrounds the diseased tree. Trees typically grow high with long branches; for this reason, they have the potential of growing into dangerous zones such as power lines, residential or commercial properties. However, not all trees need to be uprooted; some trees only require tree surgery which when performed properly removes the diseased or dangerous portion without the necessity of removing the entire tree. This surgery could include trimming and pruning and/or the removal of the diseased part of the tree. This requires a professional hand who would be able to diagnose the type of disease before deciding on the appropriate solution. When tree roots overgrow onto property driveways or sidewalks, they can be dangerous to pedestrians if mistakenly stepped on or kicked. Tree roots growing onto driveways can also damage car tires. In such cases, trees should be totally removed. The removal of dead trees should only be done by a professional. This is where the services of AAA Tree Service are required. The experts at AAA Tree Service offer a level of personalized service to meet all their customer’s needs. AAA Tree Service is a fully licensed company whose main goal is to preserve the aesthetics of your property and to beautify your environment. The AAA Tree Service Company operates with a team of professional arborists who carefully examine and decide on the best solution to treat and restore your damaged or diseased tree. Their aim is to restore trees while keeping in mind the best interest of their customers. AAA Tree Service Company in Long Island offers various tree services ranging from Tree Removal, Tree Spraying, Tree Pruning, Deep Root Fertilization, Stump Grinding, Mosquito Spraying, Tree Disease Control, Tick Spraying, Land Clearing and Grading, Storm Damage, Landscape Designs, Tree Trimming and Topping, among others. Expert Tree Services: If you’ve planted a tree and are unable to handle the idea of having to cut it down, AAA Tree Services renders the best professional services. Their goal is to provide their customers with the best ideas and ways to keep their beloved trees while making sure it doesn’t cause any damages to the property during storms or under any weather conditions. Cost of Services: Cost of services have been found to be a major challenge to most customers due to the relatively high rates in tree removal services. 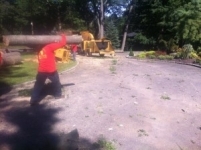 However, despite offering high-quality services, AAA Tree Services will not cost you an arm or a leg. The AAA Tree Service Company provides customers an accurate cost estimate which will help prevent excessive spending and also prevent damages to your roof and property in times of storms or bad weather. AAA Tree Service also works with insurance companies to ease the burdens of cost on its customers. All costs can now be paid through insurance companies. Pro Tree Trimming on Long Island: You can choose the direction you want your plants to grow in so as to avoid excessive growth over your home’s roof or power lines. Getting your tree trimmed right after storm holds a few risks, so it is better to do the trimming before a problem pops up. AAA Tree Service has you covered anytime. Long Island Arborist: Need a Tree Doctor to answer questions on a particular type of Pine, Fruit Tree or any other type of tree you may want to know about? AAA Tree Service is just a call ahead. They make house calls. Removal of a Dead or Just Plain Ugly Tree: Tree and branch removal can be a really tricky, dangerous and messy job. Leaves and branches that fall off during the removal process need to be properly cleaned up. The crew at AAA Tree Service has the experience to deal with that. Tree Planting on Long Island: AAA Tree Service works with professional arborists who determine the best method of planting trees on your property. They also give the best information on the types of trees that will grow and flourish. If you are in need of a professional to help transplant your tree or shrub in order to avoid any damages, they can provide a perfectly transplanted job done with the utmost care. At the AAA Tree Service Company, emergency tree removal as well as hazardous tree removal services are promptly attended. They help breathe new life into your property.